Everyone loves decals for decorating their homes. They’re inexpensive, temporary, and so much fun, perfect for decorating a rental and for those with temperamental tastes, especially children. There’s a decal for virtually every style and purpose: chandeliers for the romantic, roads for truck-loving kids, flowers for the girly-girl, tress for the nature buff and Harley-Davidson logos for the man cave – in addition to the polka dots, chevrons, and stripes in every color and size. What you probably didn’t know is that decals have gone beyond the standard wall sticker. 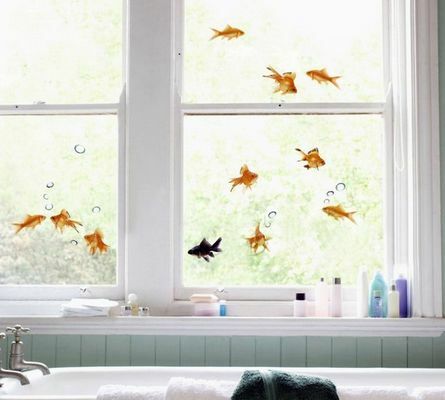 Check out these five inventive ways and places to stick on decals and improve your home’s appearance instantaneously! Hate those hideous tiles but no budget to replace or repair them? Stick a “tile tattoo” – decals made specifically for tiles – in a color or pattern you love and transform your bathroom or backsplash. 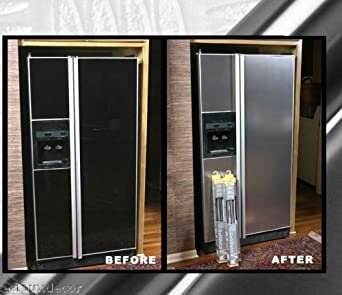 If you reeeally wanted a stainless steel fridge but couldn’t afford it, cover yours (or any other appliance – or even cabinets!) with stainless steel film (or other “finishes”) for a brand-new surface. When you can’t stand looking at your cracked laminate counters for one more second, cover them with an instant granite sticker and voila! New counters! Who needs a headboard? Stick on one of these beauties for a fraction of the price (and easy changeability with the styles!). For more styles, click here. Moldings are expensive and a big commitment. Molding decals? Not so much. Where will you stick a decal next?